(CN) – U.S. Secretary of State Rex Tillerson arrived in Moscow Tuesday to discuss the Syrian civil war with Russian officials, and even his landing in the country proved eventful — a large grass fire broke out near the airport just before his plane touched down. 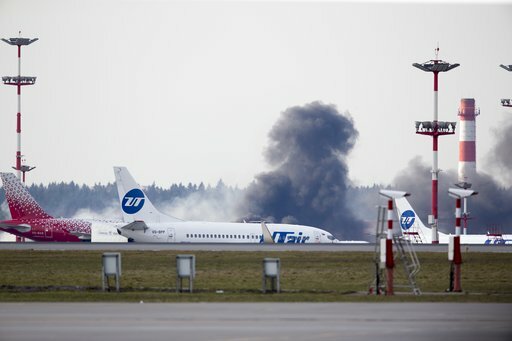 Russia’s emergency situations ministry said about 100 square meters (about 1,076 square feet) of grass caught fire just outside the Vnukovo airport before Tillerson’s plane landed. The airport said in a separate statement that the fire was outside the airport and it didn’t affect its operations. Tillerson’s visit to Russia is the first official trip to the nation by a member of President Donald Trump’s Cabinet, and the meeting is expected to be tense. Russia has been angered in recent days by U.S. allegations that it was complicit in Syrian President Bashar Assad’s use of chemical weapons last week. On Monday, a senior U.S. official told the Associated Press that the Trump administration believes Russia knew about the chemical weapons attack in advance and later bombed a hospital where victims were being treated to cover it up. Tillerson’s visit also comes against the backdrop of an FBI investigation into whether Russia colluded with Trump’s campaign to influence the 2016 presidential election. Tillerson is scheduled to meet Wednesday with Russian Foreign Minister Sergey Lavrov. So far, not meeting with Russian President Vladimir Putin has been confirmed.